At Cochell Family Dentistry, you and your family can always expect to have our husband and wife dental team’s full attention. Dr. Christel Cochell is proud to offer a passionate and skilled approach that is head and shoulders above the impersonal atmosphere found at most corporate dental offices. Keep reading below to learn more about her! What is Your Favorite Part of Being a Dentist? 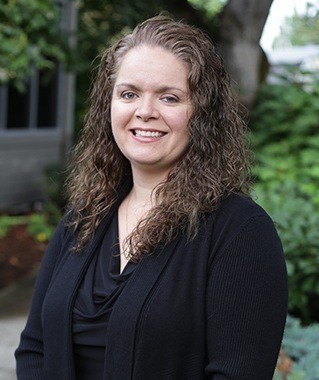 Dr. Christel has been working in dentistry for 13 years and counting, and she truly loves what she does. Her favorite part of this job is getting to help so many people enjoy the benefits that come from a healthy mouth! Dr. Christel is originally from here in Salem, and she is actually the first person in her entire family to graduate from college. Her family consists of her husband Dr. Travis, their Australian Shepard PJ (Pocket Jacks), and their black cat Carabelli. When she isn’t busy at the practice, she is extremely passionate about volunteering and has worked with several worthwhile organizations, including Medical Teams International and the local Boys & Girls Club. In the past, she and Dr. Travis have also gone on mission trips to Mexico and participated in the Neighborhood Dentist Program. Her personal hobbies include hiking, camping, and playing pickleball.